On this page you find data science know-how in the form of talks & presentations, event announcements & reports, articles, language & library features, and more. In general, the know-how illustrated in the single pieces can be readily tested and applied on datapark.io. You can register for free under datapark.io. Fitch Learning, the CQF Institute and The Python Quants have created a new certification program to master Python for compuational finance and financial data science. The two 2-day sessions take place at the beginning of October 2015 and November 2015, respectively. Visit the certification page for further details and for registration. At the end of October 2015, the first Quant Insights conference will take place. The conference is organized in co-operation between the CQF Institute, Wilmott and Wiley Finance. Dr. Paul Wilmott will give the keynote speach at this conference. Visit the conference page to learn more about the speakers and to register for the conference. For the second time, the For Python Quants conference takes place at the end of November 2015 in London. The CQF Institute in co-operation with The Python Quants Group organizes this exclusive event with three days of Python training and a one day conference. Check out the super early bird and early bird offerings under http://fpq.io. The Web pages accompanying the two books by Yves Hilpisch have been updated recently and now provide a wealth of additional resources. Among others you find links to the hosted IPython/Jupyter Notebooks and code files, links to the Github repositories and also video tutorials explaining how to best make use of these resources. 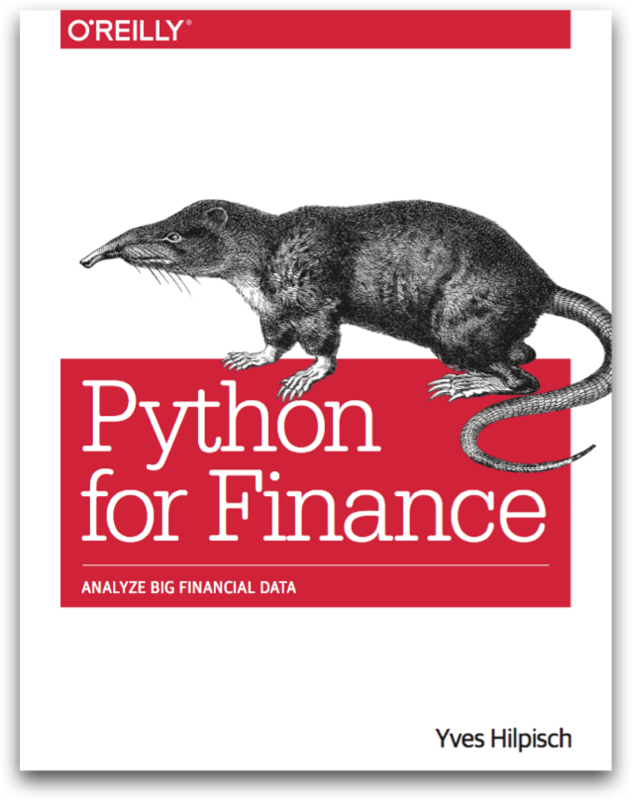 The page for the Python for Finance (O'Reilly) book is available under http://python-for-finance.com. 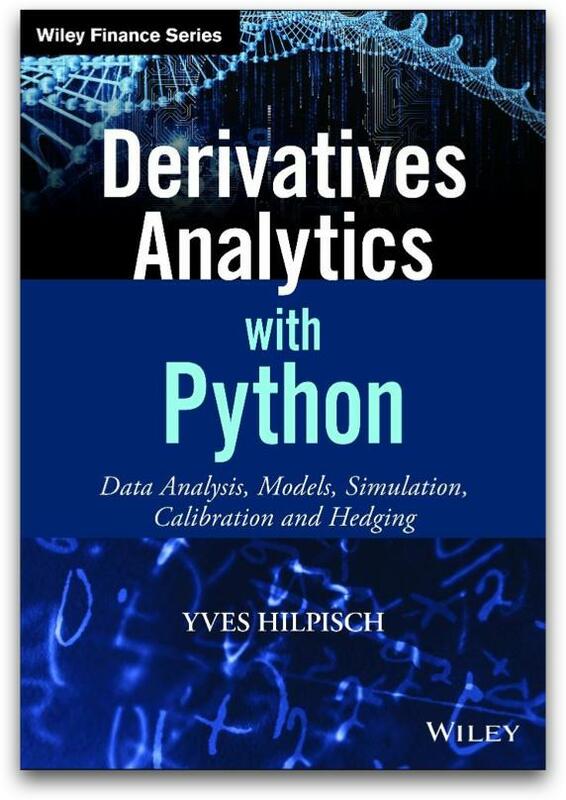 The page for Derivatives Analytics with Python (Wiley Finance) is available under http://derivatives-analytics-with-python.com. datapark.io now features Dropbox integration. This allows you to do data science not only in the browser but completely cloud-based. No need to download or upload your code and/or data files anymore. More and more organizations use cloud-based storage services like Dropbox to store corporate data. The new feature allows to work directly on, for example, data sets stored in Dropbox and to save the results of the analysis also directly in Dropbox. No need any more for emails or other inefficient data transmission mechanisms. The integration with Dropbox also allows for a simple Project Workflow for which the folder sharing functionality of Dropbox can be used. Members of a team sharing a certain folder can now more easily collaborate. The Python for Quant Finance Meetup group in London is still continuously growing and currently has almost 900 members. On 10. July 2015, a meetup took place that focused on Machine Learning and its applications in Finance. With 140 RSVPs, the event was the most popular one for the group so far. The event was again hosted by Thomson Reuters in Canary Wharf with its excellent facilities and service. In co-operation with Deutsche Boerse Group and Eurex, The Python Quants conducted the first conference with a focus on Open Source software and technologies and their applications in Quant Finance. The conference took place on 05. June 2015 in Eschborn in The Cube of Deutsche Boerse Group. Internationally renowned speakers from the UK, Germany and even Canada presented about different topics of importance for those working in Quant Finance and using or planning to use Open Source software. The detailed schedule and and slide decks are found under http://osqf.tpq.io. With these IPYNBs you can immediately get started with doing basic and advanced data analtics. "Forecasting is required in many situations. Stocking an inventory may require forecasts of demand months in advance. Telecommunication routing requires traffic forecasts a few minutes ahead. Whatever the circumstances or time horizons involved, forecasting is an important aid in effective and efficient planning. This textbook provides a comprehensive introduction to forecasting methods and presents enough information about each method for readers to use them sensibly." Read it here: Book Page. After its successful starts last year in New York City on 14.03. and in London on 28.11. the "For Python Quants" conference returns to Wall Street. This time there will also be technical and financial Python bootcamps during the week before the conference. The conference offers valuable insights from industry leaders using Python and other open source technologies in Quantitative Finance. Among others, speakers include Dr. Mark Higgins & Kirat Singh (Washington Square Technologies), Dr. Jess Stauth (Quantopian), Phillip Cloud (Continuum Analytics), Chris Parmer (Plotly) and Sri Krishnamurthy (Quant University). Check out the conference and bootcamps page for more details under http://forpythonquants.com. Dr. Malcolm Sherrington (Amis Consulting): Interoperability of Python, Julia & R — The Julia programming language is renowned for being very easy to work with and fast. In this talk, Malcolm discusses a feature which is less well known, how easy it is to utilise modules from other languages, including C, Fortran, C++, Java, R and Python, from within Julia. To show that the cooperation is not all one-way, Malcolm will indicate how Python can use Julia to overcome "two-language" problems. See the HTML. Or Download the PDF. Antonio Roldao, PhD: Scala in Finance — In recent years, Scala has gained significant traction in a number of Financial Institutions. This talk describes the Pros and Cons of this language for large Big Data systems applied to Finance. See the slides. Carole Griffiths (Plotly): Interactive D3.js Visualizations with Python & R — Using Plotly on a a central notebook engine and introducing the widget's. See the slides. Dr. Ian Huston (Pivotal): Bring Your Code to Your Data: Embedding Python (& R) in a Distributed Database — When working with large volumes of data it makes sense to minimise data movement by doing your analysis close to where your data is stored. Ian shows how to write Python (and R, Java, C etc.) code that runs inside PostgreSQL compatible databases, including the distributed Pivotal Greenplum and HAWQ databases. See the slides. Dr. Yves Hilpisch (TPQ.io): Open Source Deployment via the Browser — It is complex, costly, lengthy and risky to deploy heterogeneous open source components across an organization. Web-based technologies allow for a central, unified deployment with end users only needing a (current) browser. Such a strategy facilitates introduction and maintenance of Open Source components e.g. for use in Quant Finance. See the slides. Thomas Haslwanter: An Introduction to Statistics — Thomas has written a helpful introduction to statistical methods using Python as the language of choice to implement statistical models. There is an HTML as well as a PDF version available. Source codes are available as a Github repository. Visit the Web site. Write us under team@datapark.io. Stay informed about the latest in Open Source for Data Science by signing up below.